After the Getty museum we headed to Santa Monica beach and Pier. What at first looked like a trans-Antlantic version of Blackpool in time turned into a very atmospheric venue for people watching and shopping! 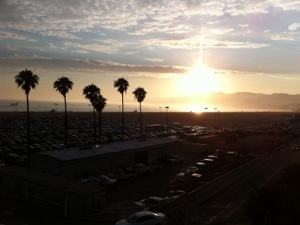 The highlight was the band playing on the end of the pier and watching the sun go down over the Santa Monica hills.